August 2018 Previews Rundown: “Guardian Angel” and Silver Teased! The solicitations for issue #8 are now out! In past interviews Ian Flynn has mentioned that there is yet another new heroic character yet to appear, and I believe this will be her debut! The exact nature of this new character is yet to be revealed, but I surmise by the emphasis (and the capitalization) that her name is Whisper, and that she will likely have some sort of angelic appearance, perhaps being a species of flying animal. One might also hypothesize she has some type of sound or voice based ability based on the solicitation as well! Unfortunately, we will likely not get a glimpse until the decide to release the main covers shortly before launch! 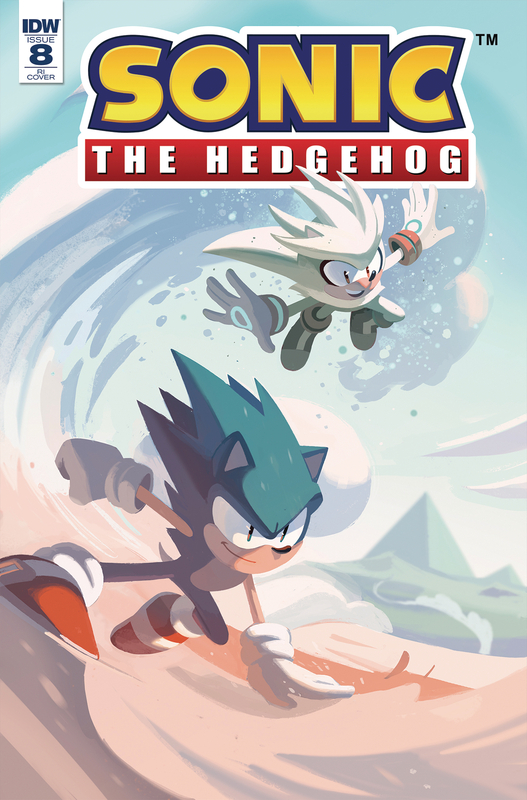 Likewise, the Retail Incentive cover by Nathalie Fourdraine features Sonic along with the familiar face of Silver the Hedgehog! Like Tangle and Blaze, it seems they will be introducing a brand new hero along side another time-space hopping hero. With these additions, the roster of characters featured in the comic continues to swell, opening up all sorts of potential future storylines. What new adventure is Sonic setting off on? Who is the new villain he is up against? We will find out soon when issue #8 go on sale August 22nd! This issue will be written by Ian Flynn per usual, and illustrated by Evan Stanley, including the yet unrevealed A Cover. The B Cover will be the IDW debut of Gigi Dutreix, the creator of the Sonic the Hedgehog fan comic, The Murder of Me. Finally, although the Diamond website incorrectly cites Evan Stanley as the cover artist, the RI Cover will mark the 8th consecutive variant by the talented Nathalie Fourdraine! I am especially excited about how IDW has been plucking talented fans from the community like Nathalie and Gigi and making them a part of an official property like this. Once again, IDW shows they really know how to connect with the fans and recognizes their contributions and passion for Sonic! It goes a long way in fostering a sense of community, and encouraging artists and writers to continue following their dreams. Which are you more excited for? The debut of the new character, Whisper? Or the return of Evan’s and favorite, Silver? Let us know in the comments below! Previous Issue #5 Covers Are Here! Next BumbleKast #69: Tangle and Blaze?